It suddenly occurred to me standing at the meat counter that buying a whole roast is a lot cheaper than a bunch of chops. So I bought the roast and couldn't bring myself to cut it into chops. I gave it a quick brine with salt, sugar and molasses and put bay leaves on top when I put it in the oven. I sprinkled a little dried thyme around it too. I set it on a rack in the roasting pan so it would cook evenly. A meat thermometer went in the centre. 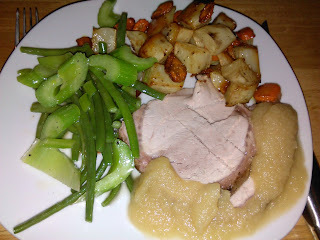 The potatoes and carrots were tossed with olive oil and salt in the pan before the roast was set in the centre. That's store bought apple sauce, my last jar. Once it's gone I'll be cooking down a fresh apple instead. The vegetables are fresh beans, green onion and celery. I boiled the beans, drained, added the celery and onion and finished it all in butter with a little salt and black pepper. It was as delicious as it looks. Fern liked the beans this way, first time I've come up with a recipe for beans he likes.